For many, it’s a cute and bustling restaurant at the corner of Second and South Streets. But Bridget Foy’s is much more than that. First of all, in an industry which is known for brief stints, the restaurant has been a South Street institution for decades. Second, and perhaps more important, is Bridget Foy, the restaurant’s namesake. Bridget is warm, kind and soft-spoken – but don’t underestimate her. She has, over the past decade, become a quiet leader. But to understand all of that, we must begin at the beginning. Bridget Foy’s opened as a singles bar back in 1978. It was initially called the East Philly Café, a moniker that many were trying to tag on the neighborhood. During the late 1970s and early 1980s, South Street was a significant nightclub destination, and East Philly Café was part of the scene. Under the leadership of John Foy, the café succeeded. Then, one of the cocktail waitresses working there, Bernadette, caught John’s eye and the two began dating and eventually married. Soon thereafter, baby Bridget was born. The East Philly Café was renamed after Bridget in 1982, and its focus began to shift from singles bar to a more casual, sports-focused bar and restaurant, and patrons liked the change. During the next decade, Bridget Foy’s became a favorite haunt for sports personalities – athletes and writers alike. In fact, the Philadelphia 76ers’ Charles Barkley became – and remains – a good friend. During the 1990s, tastes once again shifted, and a greater degree of attention to the food quality and the restaurant’s aesthetic called for the addition of an open kitchen. All the while, Bridget was growing up in the restaurant, observing, learning and exploring the industry. After spending the early years of childhood in suburban Southern New Jersey, Bridget moved with her parents to the family home at 2nd and Fitzwater Streets, where she truly became interested in the hospitality industry. After high school, Bridget enrolled at Johnson & Wales in New York City, studying hospitality. After graduating, she remained in Manhattan for a few years, first working for BRGuest Hospitality, a Mexican restaurant in SOHO and later for a small Italian restaurant. While she enjoyed her time there and valued the experience, Bridget always knew she would return to Philadelphia and, in 2004, did just that. She returned to work at the restaurant with her parents and, little by little, applied what she learned in New York. Bridget’s “fresh eyes” brought some new ideas, and the Foys once again invested in changing the look of the restaurant and its menu to suit the changing demands of South Street clientele. For example, the restaurant side of the house became even more family friendly, with updates to the menu to suit a broader array of tastes. Additionally, Bridget turned the top two floors of the restaurant building into catering venues – one for smaller parties and one for larger. The community responded, bringing birthday parties, engagement parties, rehearsal dinners and baby showers all to the venue. Most of these events were family social events, and not large corporate parties. Bridget noted that she often sees couples who celebrate their engagement at the restaurant return later for a baby shower. Shortly after her return, Bridget married Paul Rodriguez, and the couple set up residence on the 200 block of Christian Street. With Paul’s background also being in the hospitality industry, he quickly became part of the restaurant family. Noting that it was a “change of mindset” for him (his background is in fine dining), Paul is quick to state that he is happy to be part of a sole proprietorship with a 38-year history and a staff that is like family, and sees many advantages not only to the restaurant’s location but also to its pragmatic outlook. To this, Bridget added that the symbiotic connection between a community and its local businesses is critical, noting that when proprietors live where they work the money spent filters right back into the community. When I asked what the couple loves about Queen Village and what they would like to improve, the former far outweighed the latter. Bridget was quick to point out the sheer convenience of Queen Village – the ability to walk to markets and coffee shops and to mingle with a great group of parents with young families. Paul added that they are very excited to be a part of this neighborhood, with their business, home and children all comfortably in sync. Of course, given the location of the restaurant and the many new initiatives being discussed, Bridget and Paul noted that change, once again, seems imminent. For their part, they would welcome a major project that induces significant change to South Street – one that would provide it more of its own identity once again. As I looked around the restaurant, I saw Christmas decorations that Bernadette Foy herself selected and placed. John Foy still works within the business office. 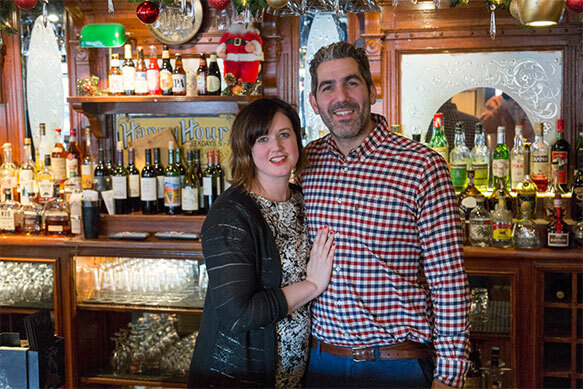 And Bridget and Paul, with only a couple of years under their belt at the restaurant, show patience, diligence and respect for the legacy of Bridget Foy’s. Their children, ages 5 and 2, visit the restaurant regularly and are as happy there as they are in their Queen Village home. Certainly, under Bridget’s able hands and with familial resolve, Bridget Foy’s has grown more deeply rooted in the community.